Physical Properties of Stars Revision Questions. 1. 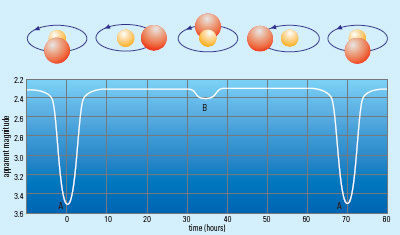 Explain the difference between Optical Double stars and True Binary Stars. True Binary stars are linked together Gravitationally and orbit a common centre of mass. Optical Double stars merely appear nearby but may be light years apart. 2. How many times brighter is a star with a magnitude of 5 compared with a star with a magnitude of 1? 3. What is Pogson’s ratio? 4. Give 4 factors that affect the apparent magnitude of a star. Amount of light absorbed by Earth’s atmosphere. 5. What is the magnitude of the brightest star in the sky? 6. What is the Absolute Magnitude? 7. Name two types of variable star. 18. What is a True Binary? Two Stars orbiting around their common centre of mass. 19. What is a Cepheid Variable? A giant yellow star that regularly expands and contracts in size. 20. What is an eclipsing binary? If two binary stars orbit each other in a plane along our line of sight, two stars will eclipse each other. 21. What is the Primary Star? 22. In what way is the variability of light intensity of Cepheid Variables different to that of eclipsing binaries? 23. Draw the light curve of a Cepheid Variable. 24. Draw the light curve of a Eclipsing Binary. The apparent motion of near and more distant objects in respect to each other, caused by the motion of an observer. 26. 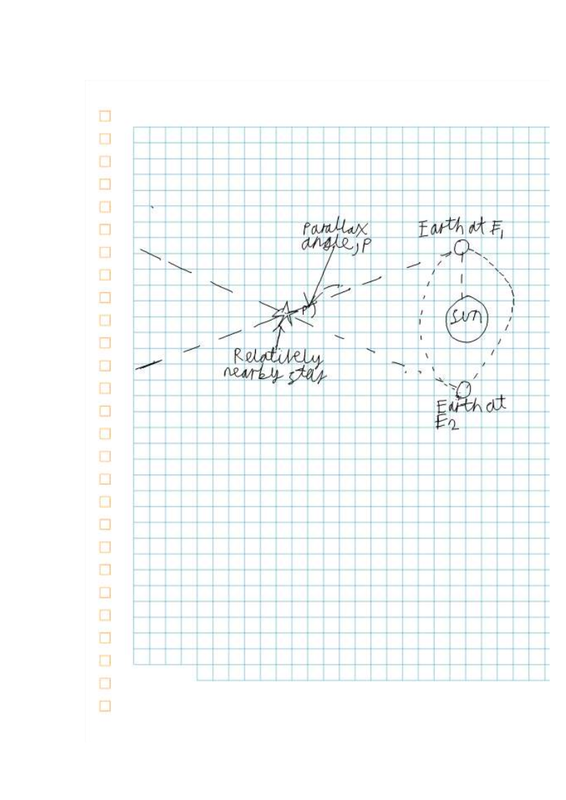 Describe the method of heliocentric parallax to determine the distance to nearby stars. 27. What is the definition of a parsec? The distance at which a star would have a parallax angle of one arc-second. 28. Describe how Cepheid Variables can be used to determine stellar distances. Use the distance modulus formula to calculate distance.